(CNN) — Israeli airstrikes pounding Gaza are deepening the humanitarian crisis in an area that was already in deep distress, according to a United Nations aid official. 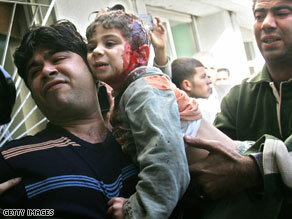 A man carries a wounded Palestinian boy into a hospital in Gaza City on Sunday. “The situation is absolutely disastrous,” U.N. official Christopher Gunness told CNN on Sunday, as a second day of aerial attacks brought the death toll in Gaza close to 300. Hundreds more people have been injured. Israel has said the airstrikes are a necessary self-defense measure after repeated rocket attacks from Gaza into southern Israel by Hamas militants. Israeli leaders say they are trying to minimize civilian casualties in Gaza. He described people huddling in their basements for safety as bombs fell. Gunness, a spokesman for the U.N. Relief and Works Agency for Palestinian Refugees (UNRWA), said the agency has been unable to get needed medical supplies into Gaza for more than a year, because of Israel’s blockade of border crossings. Israel did give in to requests from the Red Cross and others to allow 30 trucks loaded with fuel, food and medical supplies to pass into Gaza through the Kerem Shalom crossing Sunday morning, along with five ambulances contributed by Egypt, an Israeli security source said. The Red Cross and World Food Program trucks that moved across the border Sunday were the first deliveries allowed by Israel since 80 trucks moved through on Friday. Gunness said Israel cooperates with his agency’s efforts to get humanitarian supplies into Gaza — but that’s not enough. Gunness urged both sides to stop the violence and talk, saying the bombardment of Gaza doesn’t serve Israel’s strategic interests.